Paw-Paw's Mini Hammer-In NEXT - ABANA Conference 2004! West Virginia Armour-In Parkersburg, WV, May 13-16 was hosted again by Ted and Ann Banning. This year's event was about the same in attendence as last. Again it was a very nice intimate affair where everyone got to meet each other and learn from each other. Among the 24 or so attendees were master armourer Allen Bauldree, Mark Berry AKA "Clang" Clang's Armoury and Peter Buchanan, metal artist from Bedford, VA. It was announced that next year's event will need to be sonsored by someone else in the group. The next Armour-In may end up in Kentucky. Watch for announcements. Continued on page 3. . .
Paw-Paws Mini Hammer-In May 8th was the Celtic Festival at Historic Bethabara Park in Winston Salem, NC. 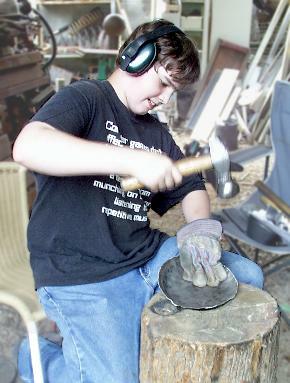 Invited guest blacksmiths included Rich Waugh from St.Croix, Virgin Islands, Billy Phelps of NC, Glen Connor of West Virginia, . . . Continued on page 2 . . .
Little Giant Video, "How to cure the Bang, Tap, Miss Blues"
Now available exclusively from anvilfire.com! If you have a Little Giant you NEED this video. If your Little Giant ever does the "Little Giant Hula" you REALLY need this video! Dave explains the bad behavior of many Little Giants and explains how to fix it. In the past the Nigerian Scam (something for nothing) was the big thing out of Nigeria. Well, it has spread to many other countries, China among others.